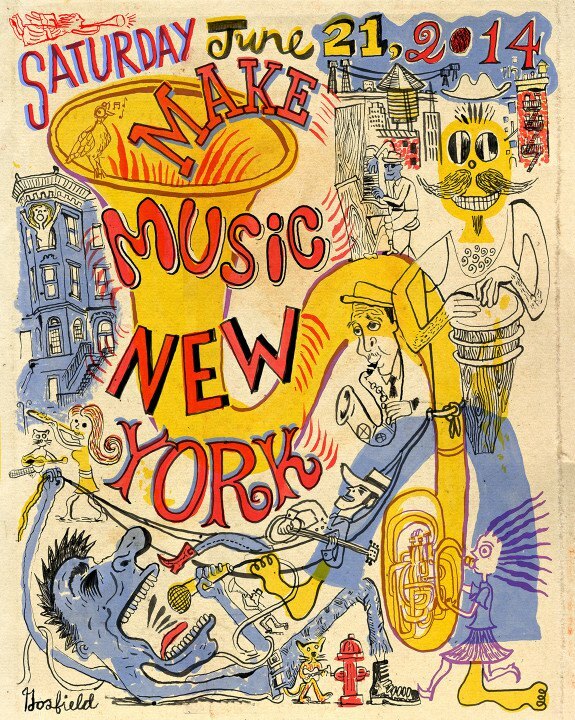 The sun is out and you should be too this Saturday, June 21st, for an amazing FREE one-day festival called Make Music New York. Anyone can attend and take part in MMNY,which features thousands of performances and takes place all across NYC on the longest day of the year. The goal of this festival is to get everyone outside, enjoying life and one another--so sport those crop tops because it's time to let loose! Of course we're going to be a bit partial to some of our loves here in the hood, so here's our top shows, MMNY edition in Bushwick! Come to Goodbye Blue Monday for a diverse line up of rock, indie-folk, electronic and pop music. Roster to include artists such as Hello Phones, Castle Black, Mad For Justice and more! Stop by Sid's Studio for a great day of music featuring SID ART, Nadia Kazmi, Roopa Mahadevan, and more! World, Experimental, Electronic and other curious genres! Musicians from the Warper Party & Silent Barn communities, as well as the Stanwix St. area! Two Stages, All Day! Little Skips, our fave neighborhood coffeeshop, offers an awesome lineup of free music all day, including performances from Bird Courage, Cave Days, and These Busy People. This vintage store will go musical for the day and put on live performances by Mammal and Beech Creeps. So far all this DIY gallery has lined up this weekend is one performance from Brooklyn Acts in the afternoon. Knowing them, the rest of the day will also be filled with music of sorts as well. Fort Useless hasn't listed its schedule for the day yet, but from their excellent track record you can count on this show to be special. Pine Box's back room is the perfect venue for enjoying free music while sipping on a high-end draught beer. Come by to see a lineup from experimental to folk, including Oh! My Blackbird and Demonic Sweaters. If you feel like enjoying the great Bushwick outdoors for the day, there's no better place than local hangout Maria Hernandez Park! The bands on Saturday include the R&B of Iampopula and hip hop of b.FUNK! Throughout the day one of our favorite East Willyb bars, Tradesman, will have rock and experimental music from Howth, Bears, and Manutara! Also enjoy their fantastic happy hour prices all day long.